A decade ago we may have turned to the television or even the radio for emergency information — but today, our smartphones are a lot more convenient. But in an emergency situation, finding the information you need, even with the internet in the palm of your hand, can be downright impossible. Sure, social networks offer speedy communications, but they're rife with rumors, hearsay and plain bad information. Google is focusing on putting the important information front and center, so you don't have to hunt for what you need when time is critical. SOS Alerts will include information like maps, top news stories, emergency contact numbers and links to donate to relevant charities. Google Maps will also let you know about emergency-related road closures and transit information. The information you see is hand-curated — meaning a Google employee reviews it to be sure it's accurate before it's posted — so, unlike the posts flying by on social media, you can trust the information you see on Google. Which events qualify as a "crisis" for SOS Alerts is a little less clear. Google says the service covers both "natural and human-caused crises," but the criteria for qualifying is vague. If it's big enough to be trending on social media, it's probably going to have an SOS Alert on Google, too — though smaller, more regional emergencies may not make the cut. However, Google hopes to expand the service, which could make it a timely source of more local news, too. 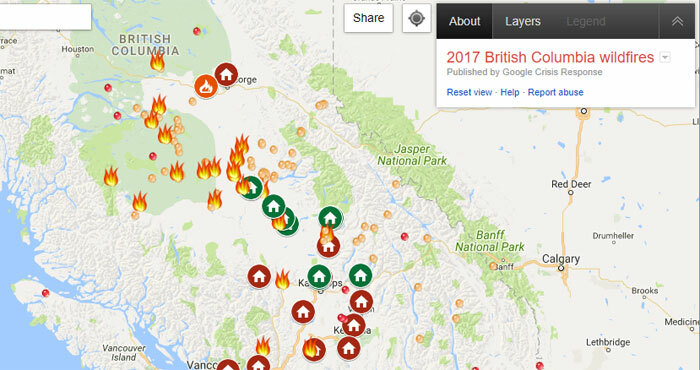 You can see SOS Alerts at work by searching for "British Columbia wildfires" on Google right now. 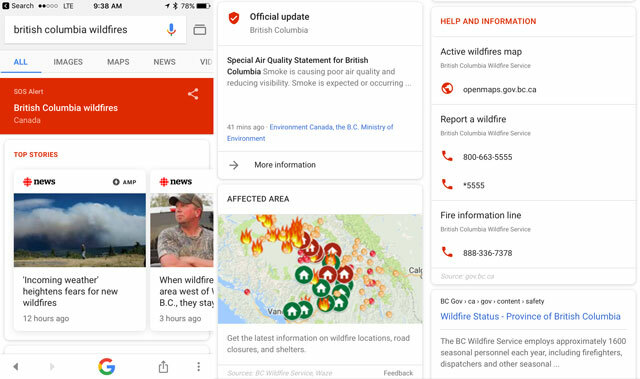 At the very top of the page you'll see top news stories, followed by official government updates, a map of the affected area (showing the location of fires as well as shelters), official government Twitter activity on the wildfires, and local emergency contact information. Standard search results come up under all of this information, but chances are the SOS Alert was what you wanted to see.